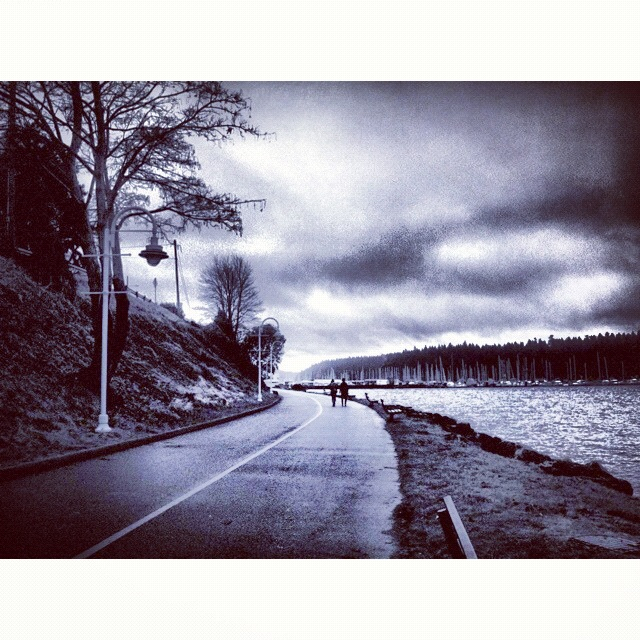 The Pacific Northwest is known for being rainy and grey in the winter. In Vancouver and Seattle, clouds can settle in among skyscrapers, creating the sensation of a neverending (and very damp) night. Where I live, though, is a unique geographical space. First, it’s an island, so weather patterns tend to shift quickly anyway. The part of town I live in is in the rainshadow of a mountain, slightly above the harbour, which in turn is protected from the larger ocean by two smaller islands. I can leave my house in a drizzle, and a block away, a flake of snow might fall (even if it’s 60 degrees Fahrenheit); two blocks later, there’s full-on sun, though across the street, it’s pouring rain. I turn the corner and take refuge from a hailstorm under a giant cedar. Five minutes later, the storm has passed. Everything passes. Everything changes. Just because there’s a torrential downpour and black skies right now doesn’t mean that in 20 minutes, it won’t be clear blue sky without a cloud in sight (I’ve seen it happen). And the reverse is true, too. Weather here calls me into presence like almost nothing else. From October through June, I pack rain pants and a rain cap (a Goretex ball cap that has to be one of the greatest inventions ever for outdoorsy people who wear glasses). I generally wear two layers of jacket (softshell and rain jacket), but sometimes, especially in late spring, they both get stuffed into my backpack. Just as it can go from pitch-black cloudy to clear blue skies in a short time, it can also go from about 15C (59F) to 26C (80F) in the space of a block, depending on where the sun is. This brings a whole new meaning to the phrase “hot flash.” I’ll be bundled up in layers – long underwear, shirt, softshell and rain jacket, and then suddenly, it’s like it’s the middle of summer. The backpack, of necessity, also includes a rain cover. It pretty much stays on from fall till spring, though there’s always a denial curve in October, when I think, “Oh, I won’t need it today” and then wind up racing for a dry place where I can put the cover on. The minute the rain lets up, I think, “Whew, it’s gone for the day,” and I pack the cover away. But of course, it isn’t, and this scenario repeats several times a day, until by November, I’ve accepted that I need to just leave the cover on. Winters here can get pretty dark. Sunrise in December is around 8:30am, and it doesn’t fully get light (if you can call it “light”) until around 10. Sunset is technically around 4ish, but in the depths of winter, it starts looking like evening around 2:00. Some days, it looks like someone forgot to turn on the sky. But here’s the thing: except when it’s pouring-pouring, every afternoon, as the light begins to fall towards the horizon, a stretch (or more) of blue sky opens up. It was there all along, of course, but it takes a shift in perspective, a shift in lighting, to see the sky as blue. In the summer, even when it’s cloudy, you can see the sun. Which makes it much easier to remember the adage, “The sun is always there behind the clouds.” It rarely rains, but when it does, it’s beautiful and nourishing and hydrating…for a couple of days. Then we’re ready for sun again. On those rare occasions when it’s a really cloudy summer day, though, the same blue-sky phenomenon occurs in the late afternoon and early evening. Weather demands presence. Weather says “I may change in an instant, so pay attention.” And weather – all weather – is beautiful, if only we look at it through that lens (and pack sufficient rain gear).